In the past few weeks we have found some more information about this amazingly supernatural show that we are eagerly waiting for. First of all Comic Con has released photos of the Official Swag Bags that have the Teaser Poster for the show on it (See Below). 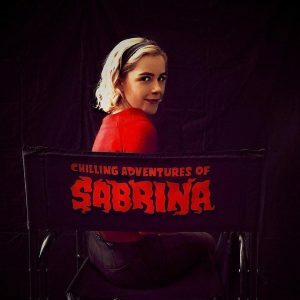 Then on Friday the 13th Netflix launched Sabrina’s instagram, Twitter, and Facebook pages willing it with witchy goodness and wicked aesthetics – Not to mention sharing some photos and videos of Kiernan as Sabrina. 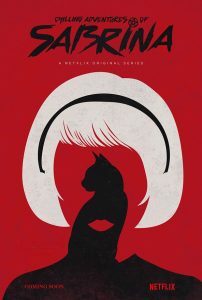 As of the past couple days there is an official page on Netflix dedicated to Chilling Adventures Of Sabrina with the synopsis as well as a release of the titles of the first eight episodes. Will we be getting a full trailer at Comic Con? Perhaps – with all this new info its definitely a possibility. Hey everyone! I’m back with some news! A few days ago a few magazine and websites from various countries. Nothing has been released yet due to an embargo, but I’m thinking it’s going to be close to the end of this month in time for their TCA Panel on July 29th. No photos were published but one of the reporters posted this photo of her and Kier during one of these interviews. Hopefully we’ll get a trailer on the 29th and a date! Hey everyone! 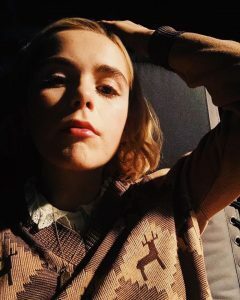 Sorry for the lack of news on here but there hasn’t really been too much aside from the fact that Kiernan is still filming Chilling Adventures Of Sabrina in Vancouver. Sticking to the comic arc written by Roberto Aguirre-Sacasa (and illustrated by Robert Hack) they are keeping the same name which is a very good hint that the show will closely follow the comic books. Some people may not be happy because it might involve a death of a certain character but as someone who has read each issue that is currently available – I am excited! Kiernan revealed the first official photo of Sabrina on her instagram account a couple weeks back. Hopefully we’ll be getting some more excited info soon but for now that’s it! Filming has been moved to Cloverdale for the time being and with that we got the images you have been dying to see! 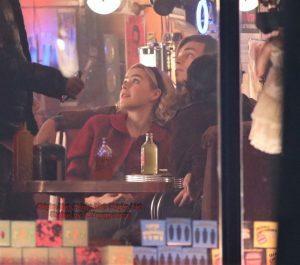 Our amazing Paparazzi friend Yapapparazzo snapped 24 images of Kiernan with Co-star Ross Lynch during a scene of The Chilling Adventures Of Sabrina – kissing and looking completely adorbs (Yes – It almost made me forget this boy played Jeffrey Dahmer). We cannot thank him enough for driving all the way to Cloverdale and getting these images in the middle of the night no less! Click on the photo below to see the album – or just head to the gallery!